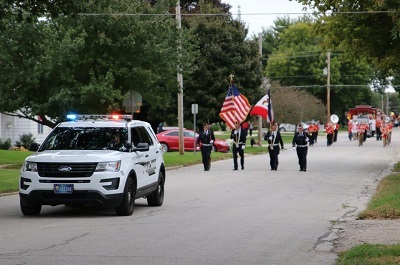 The Carroll Police Department consists of one civilian Administrative Assistant and 15 sworn officers: the Chief of Police, one Captain, three Sergeants, one Detective and nine patrol officers. All sworn personnel are trained and certified through the Iowa Law Enforcement Academy. Additional training is received through attendance at specialized schools, seminars, and in-service training. There are a minimum of two officers on duty, 24 hours a day, 365 days a year. During peak activity hours there are as many as six officers on duty at a time. Duty shifts consist of 8 and 10-hour overlapping shifts which provide maximum coverage and schedule flexibility. The Carroll Police Department provides various crime prevention programs including salvage vehicle theft inspections, business and residential security assessments, vacation security checks, bicycle licensing, and D.A.R.E. Due to the nature of the job, police officers must often perform tasks or duties which may be perceived as negative or unpopular. Our officers perform these duties fairly, impartially, honestly, and with a positive attitude. This approach has been rewarded by consistently having one of the lowest overall crime rates in the State as well as being one of the cleanest cities. The efforts of our officers are complemented by the assistance of the citizens of Carroll, who are very cooperative and proud of the clean and safe environment which they have come to expect and enjoy. The police department administrative offices are open from 8 a.m. until 5 p.m., Monday through Friday. Police officers are available 24 hours each day, seven days per week, either by contacting the communications center or coming to the east side of the courthouse and using the intercom to contact the communications center. The citizen is the most important person in this city. Without them, there would be no city. We are dependent on them. They are not to be hurried away so we can do our own thing…they are our thing. They are not an interruption to our work, but the purpose of it.